The Anti-Cruelty Society was formed in 1899 in Chicago. The first President of this Society, Mrs. Thomas, was one of the few women elected to a leadership role in an animal advocacy group during this era. In 1904 the Society opened the doors of its first animal shelter. Humane Education was an important part of the advocacy work undertaken by this group right from its early days. This label produced by the Anti-Cruelty Society is striking in its monochromatic design. The silhouetted figures of the child, the birds, the cats, and dog sit in stark contrast to the white background and, as such, would have been a strong visual symbol of affinity with the Society’s goals and aims by those who used it. 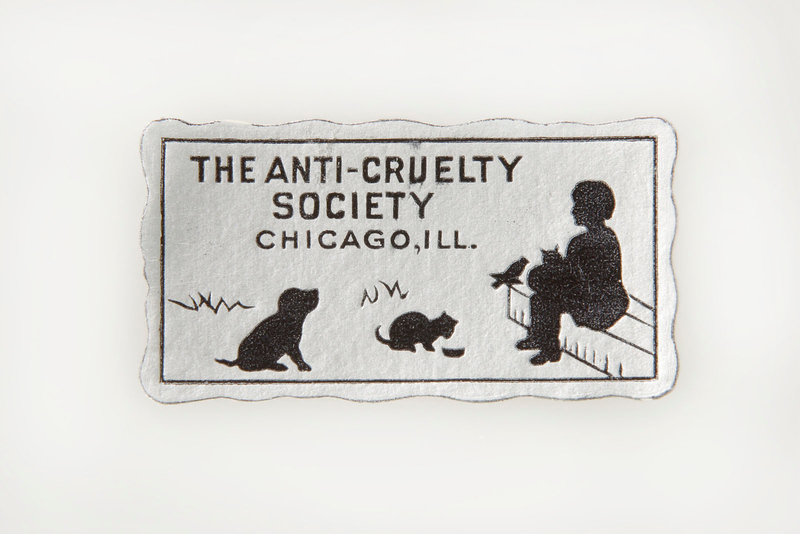 Chicago Anti-Cruelty Society label, early 20th century. Collection of the National Museum of Animals & Society.